OK. I am confused. 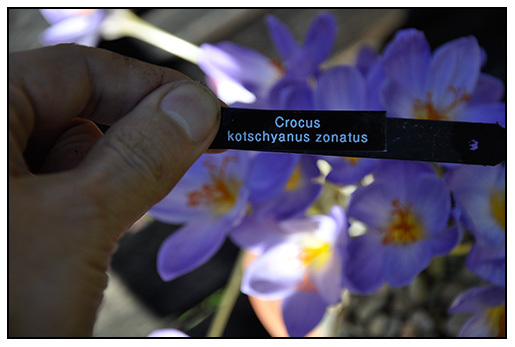 Just because I am Lithuanian, does not mean that I know my crocus, let alone the fall blooming species. 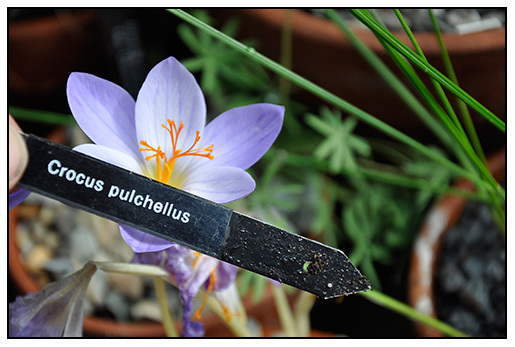 I know that when ordering Dutch grown bulbs, there is often confusion. 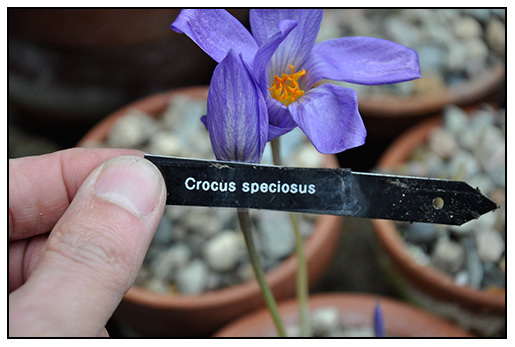 I also had read that there are often subtle differences when trying to identify the differences between some closely allied species in Crocus, but if someone can help me, I sure could use it. 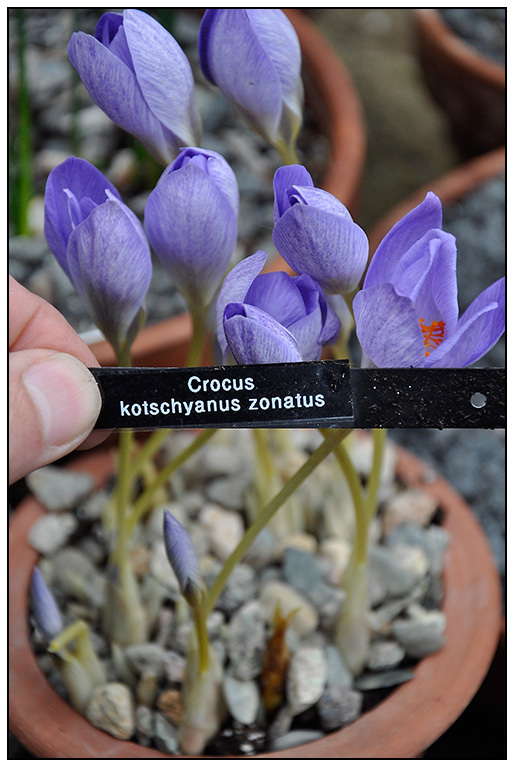 I have Janis Ruksans new book on Crocus, I have Googled until my fingers are blue, and I still am confused. 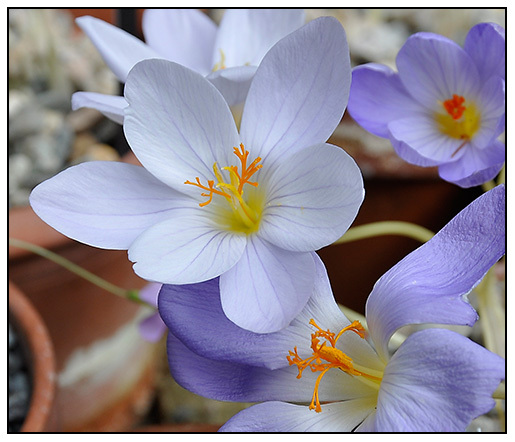 Sure, the stigma is a key identifier, but these all look fringed, and my gut says that most of you experts will just say " that's what you get when you order from the big commercial Dutch sources - lots of Crocus speciousus", but please tell me that I am not wrong? More images to come. 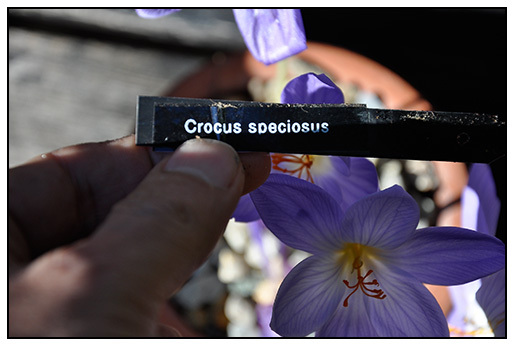 CROCUS OCHROLEULUS - REALLY? WHERE IS THE YELLOW THROAT? 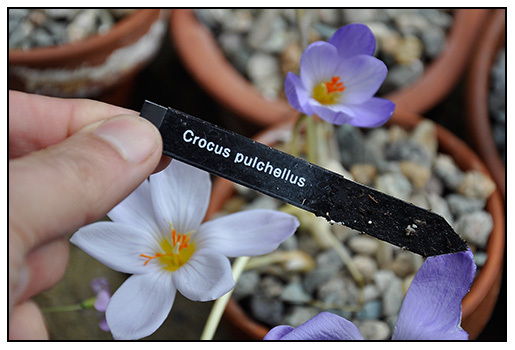 CROCUS PULCHELLUS? ARE THESE ANTHERS REALLY THE WHITE SORT THAT I SHOULD BE LOOKING FOR? 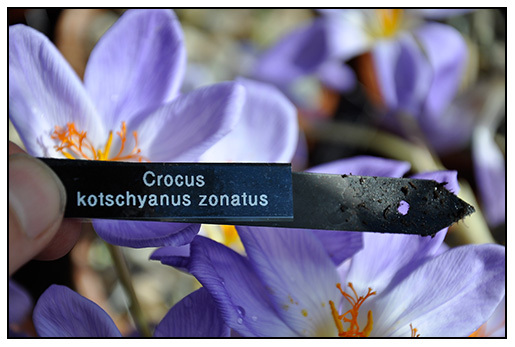 A crocus speciosus planted in a trough. 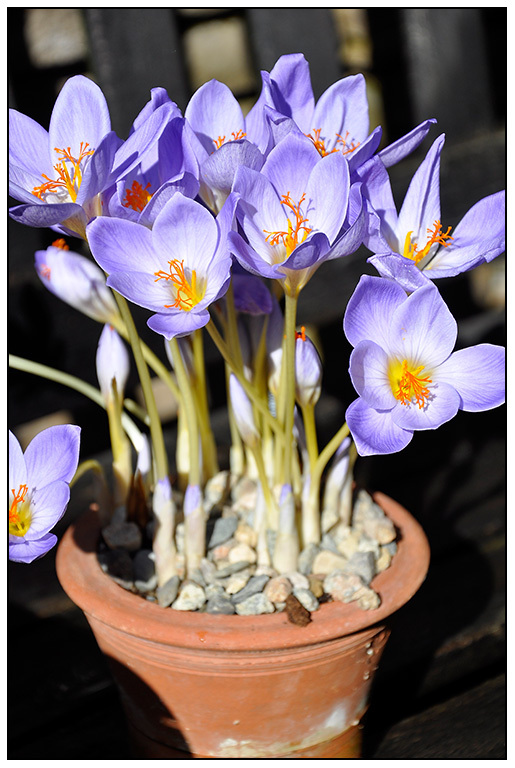 And another planted in a pot, for up-close viewing. Is it me, or are these all the same species? 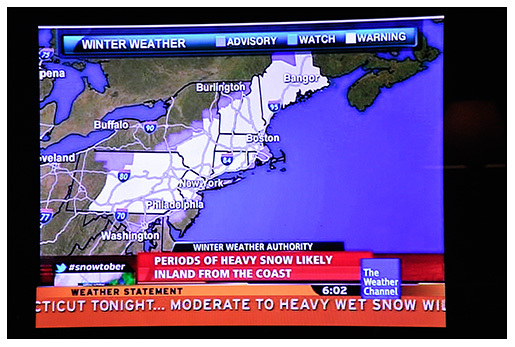 Our freak October Nor'Easter didn't fail to deliver. Over the weekend, we received its full-force, which left us here in central Massachusetts with over a foot of heavy snow, and no electricity until this afternoon ( many areas we are being told will not get their electricity back until the end of the week). So we consider ourselves lucky. 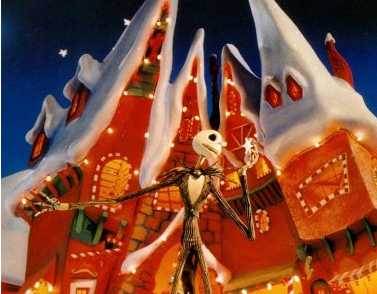 HONESTLY, I CAN"T TELL IF IT IS CHRISTMAS OR HALLOWEEN? WE HAD TO SNOW SHOVEL THE WALK FOR THE KIDS, ONLY TO FIND OUT THAT HALLOWEEN HAS BEEN CANCELLED. The garden survived the storm better than I first thought that it would. We did have a few disastrous tree incidents, one hit the house, with minor damage to the roof, another large Ash hit the pheasant coop and flight cage - pheasants are now lost all over the neighborhood, we half of our magnolia's, particularly the yellow one near the greenhouse ( see below) but that Japanese Maples proved to be more flexible than I thought, and most have bounced back to shape. This is what I woke up to this morning. My Tall and elegant Magnolia 'Gold Finch", now a victim of a historic, October snowstorm. Salvageable, but shorter. 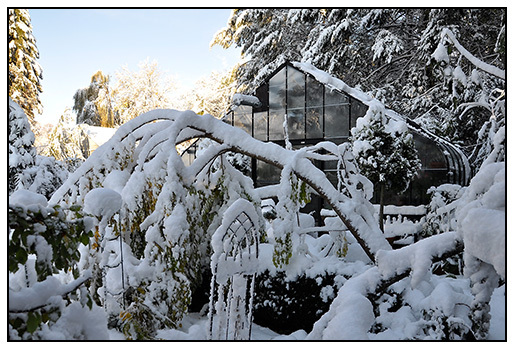 WE LOST ELECTRICITY FOR 36 HOURS, SO NO HEAT IN THE GREENHOUSE WHICH AT FIRST, SOUNDED LIKE A NON EVENT, SINCE THE TEMPS WERE ONLY SUPPOSED TO DROP TO 26 Degrees F, AND THE PLANTS WOULD KEEP THE SPACE WARM, BUT I FORGOT THAT THE SNOW WOULD NOT MELT ONCE IT HIT THE GLASS. SO HOURLY ROOF RAKING HAD TO COMMENCE, ALL NIGHT LONG. ONLY LOST A FEW PANES OF GLASS. THE PHEASANT ARE LOOSE, BUT UNLIKE THE TIGERS AND LIONS IN OHIO, WE ARE TERRORIZING OUR NEIGHBORS WITH GOLDEN PHEASANTS AND LADY AMHERST PHEASANTS. MOST HAVE RETURNED TO EAT. A BEE APARTMENT, DESTROYED. BUT ALL'S GOOD. 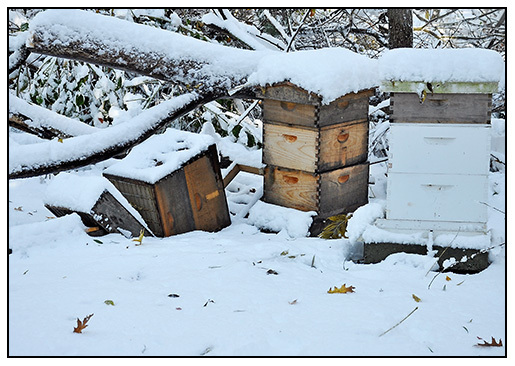 IT JUST TOOK A LITTLE TIME TODAY TO RE-BUILD THE SUPERS, UNTIL THE BEES CAME BACK- TOO ANGRY TO CONTINUE FOR NOW ( CAN"T BLAME THEM). THERE IS BEAUTY EVERYWHERE. IN THE FOREST, THE SUGAR MAPLE FOLIAGE SET AGAINST THE SNOWSCAPE IS AN INTERESTING SITE, ONE THAT I HAVE NEVER SEEN BEFORE. NOTICE THAT MOST OF THE NATIVE FOLIAGE IS ALMOST GONE. AGAINST THE BACK PORTCH, SUMMER VINES CONTINUE TO BLOOM, THIS COBAEA VINE, SEEMS TO BE HARDIER THAN I THOUGHT. 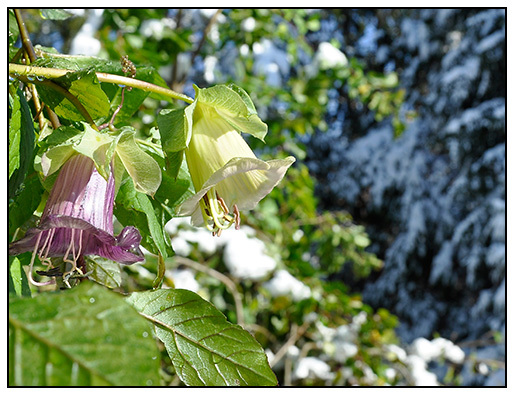 IT IS STILL FRESH AND GREEN, AND IN FULL BLOOM AGAINST A FOOT OF SNOW! SO WEIRD. 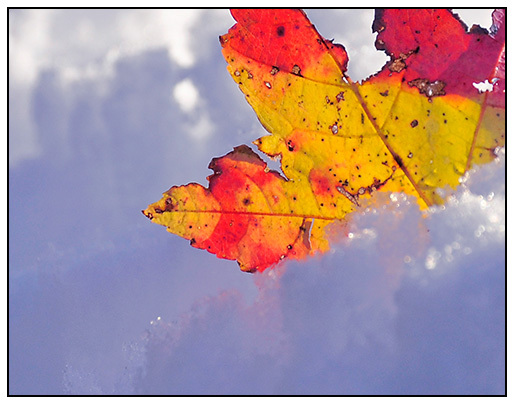 THERE ARE PLENTY OF RARE SIGHTS TO BE SEEN, LIKE THIS RED MAPLE LEAF TUCKED INTO THE SNOW THAT FELL ON THE TREE THAT CRUSHED THE PHEASANT COOP. BIRDSEYE FROZEN VEGETABLES ANYONE? WE WERE JUST TALKING ABOUT HOW LONG AUTUMN WAS GOING WITHOUT A FROST, SO WE WERE STILL PICKING BEANS A DAY AGO. I GUESS THIS IS WHAT A SNOW STORM IN JULY WOULD LOOK LIKE. 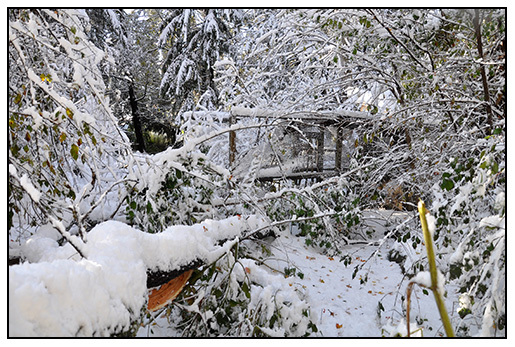 A MANZANITA OLIVE TREE, ALL COLLAPSED FROM THE WEIGHT OF THE SNOW, IS ACTUALLY FINE. IT WILL BE MOVED BACK INTO THE GREENHOUSE THIS WEEKEND. Want to avoid damage like this? 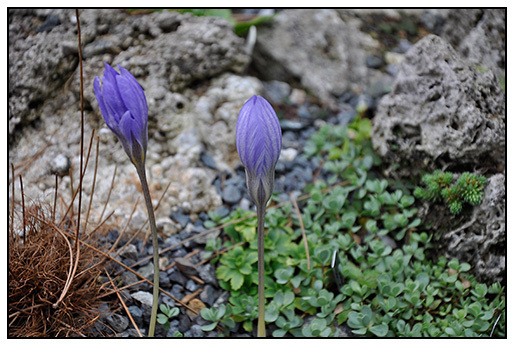 Plant native species, most have already lost their leaves. But the Norway Maple is late in deciding to change color. So over planted in the Eastern US it is perhaps America's "Golden Lab' of trees? Over bred, omnipresent, and prone to illness. On Saturday night, we were kept awake by the loud craaaak of branches and trees in the neighborhood collapsing under the weight of the snow, but today, while walking through the neighborhood, I could see that 99% of the damage happened to imported species of trees, those that have been imported from forests where there are never heavy wet snows. Our New England trees are designed for such events. In my own yard, I could see that many of the native species survived quite well. Sure, a few White Pines lost branches, and an old dead Ask tree fell, but a majority of our native forest trees are already set for winter - heck, they even have lost their leaves. 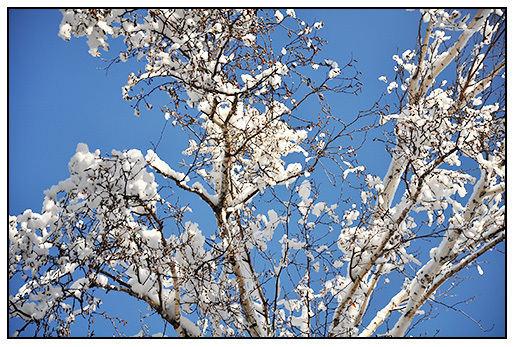 Trees from China like Magnolia, Davidia, and once widely plants and now invasive European species like English Oaks and Norway Maples proved that they could not deal with this heavy snow. Look at the above photo of our neighbors large Norway Maple ( that still has its green, summer foliage) and the below image of our native river birch in our yard, a tree dug from the woodland. The birch has already lost its leaves, but the imported species are in full green leaf. OUR NATIVE SPECIES ARE PREPARED FOR EARLY SNOW. 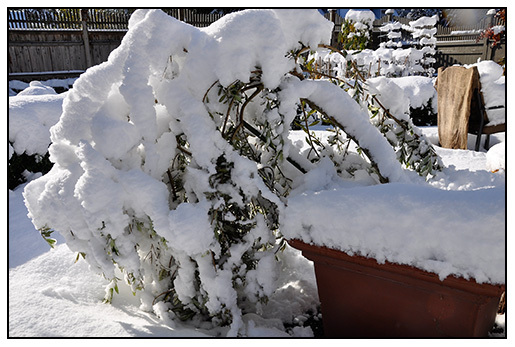 This fact holds true in the spring too - since 'late' freezes and snow can collapse a lilacs, or a budded magnolias turning the flowers to mush. 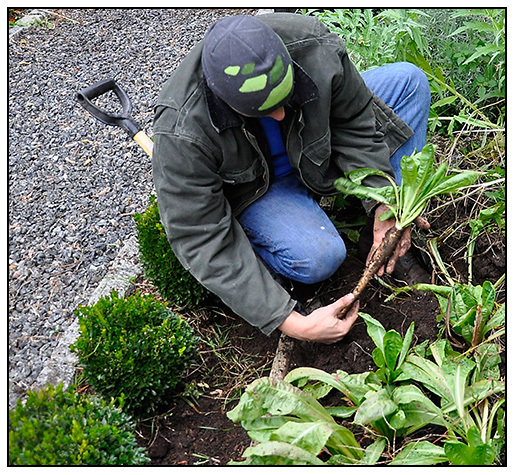 We all take risks as gardeners, but our lesson should include one that deals with consequences. Afraid of losing an investment tree? The solution is an easy one - when shopping for trees at your garden center next spring, keep an eye on your local forests, and look at your local species, if the tree you are buying is already in full bloom, and your forests are all grey, then that should be a very good hint. I'm not against importing most plants, I like to live on the edge But one must enter such relationships knowing full well that the ice is thin, and that it could end at any moment. 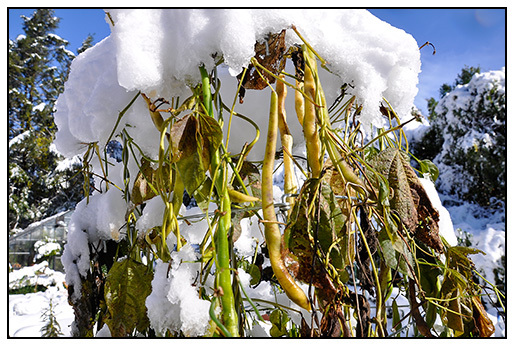 If you want to avoid something like this image below (my Robinia pseudoacacia 'Frisia' , which is more at home in the warmer parts of the south eastern US and Georgia), then try opting for a local blooming tree like a Cornus mas. AS THE SNOW BEGINS TO FALL, I DUG THE ROOTS OF BELGIAN ENDIVE, NICE AND THICK AND EARTH-COVERED - THESE WILL BE POTTED UP FOR FORCING DURING THE WINTER. Last April, on a cold, overcast and dreary day with the threat of snow ( not unlike today), I planted a crop of Belgian Endive. Belgian Endive is one of those old-fashioned crops that requires that you dig the root and force it during the winter, at one time, the only way to obtain fresh vegetables during the long winter months that were not winter-storage vegetables like squash. Few gardeners today bother to grow such crops, since Belgian endive can be purchased year-round at specialty markets, but yeah, I'm not your average gardener, and besides... I really like the crunchy, nutty taste of raw Belgian Endive - I buy a few most weeks in the winter for salads,as well as dishes where it is cooked (often braised in broth or served gratineed with cheese). 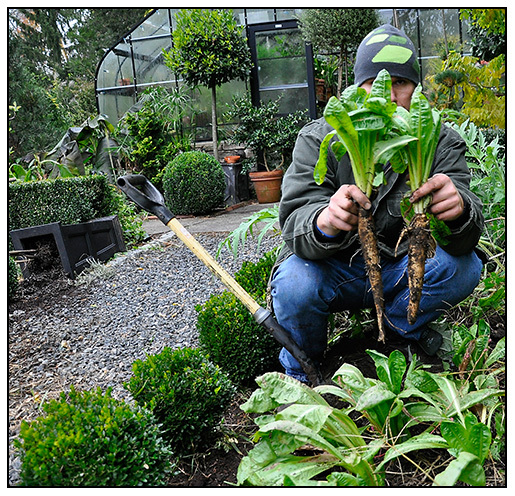 THE BELGIAN ENDIVE ROOTS MUST BE HAND-DUG CAREFULLY, AFTER A LIGHT FROST, BUT BEFORE A HARD FREEZE. WITH A FOOT A SNOW EXPECTED THIS EVENING, AND 24 DEGREE F. TEMPS, IT WAS TIME TO DIG. It takes patience to grow Belgian Endive, since true harvest of the vegetable happens 10 months after planting the seeds, but how can you beat home-grown anything with something purchased at a store. These are organic, (no fertilizer since Belgian Endive is a low-fertilizer crop), and I know exactly what went into them. Home Farming is great, but when space is limited, I prefer to grow those vegetables that I cannot find readily, the varieties that are difficult to find because either they don't ship well, or commercial growers select more sturdy varieties that ship well and last. 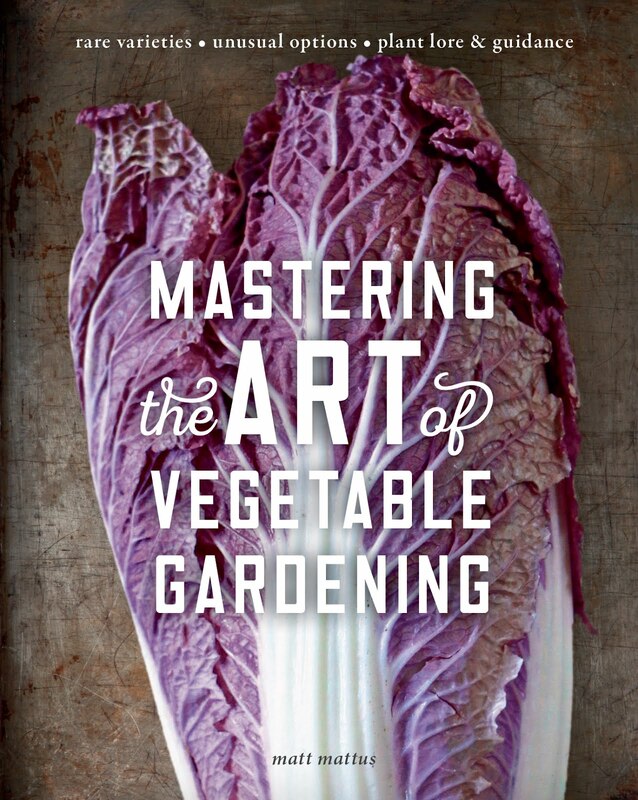 There are just some vegetables that one cannot buy truly fresh, and this is one of them. THE ROOTS MUST BE AIR-DRIED FOR A FEW DAYS AND THEN TRIMMED SO THAT THEY WILL ALL BE OF UNIFORM SIZE. 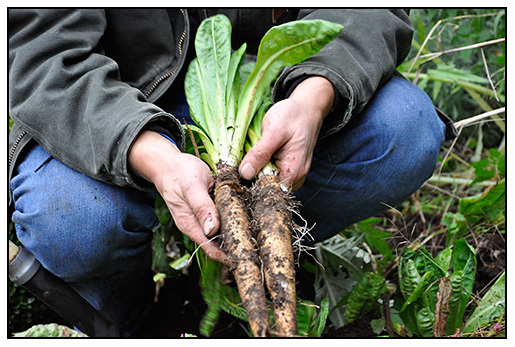 THE OPTIMUM ROOT SIZE IS 1.5 INCHES IN DIAMETER, SO, ALTHOUGH THESE ARE SMALLER, A HARVEST CAN STILL BE MADE, WITH THE HEADS OF ENDIVE BEING LESS PRETTY. Also, I have always wanted to grow some myself, in the proper way - grow the plant all summer long, dig the roots at frost, dry them a few days, and then pot them up tightly in a container where they will spend the winter in complete darkness, in a cold store room in the cellar. When I am ready to begin forcing them, I will move the container into a warmer location, but continue to keep it in complete darkness ( wrapped in black plastic, most likely, but in a warmer closet).By mid-January ( yes, Jacques), I hope to have some Belgian endive for our annual American Primula Society Winter Bash that we host. 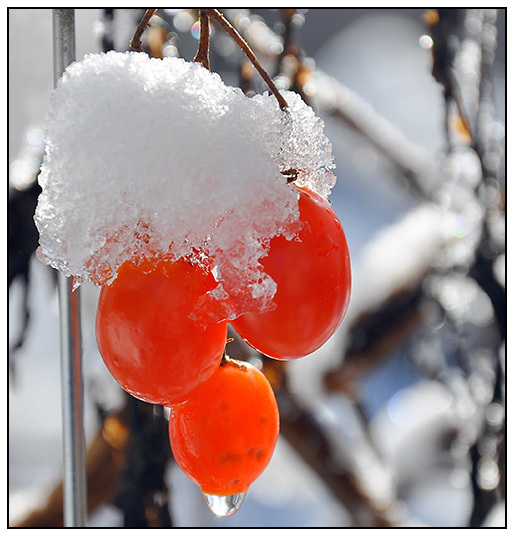 Keep fingers crossed for a winter salad of fresh Persimmon and Belgian Endive. 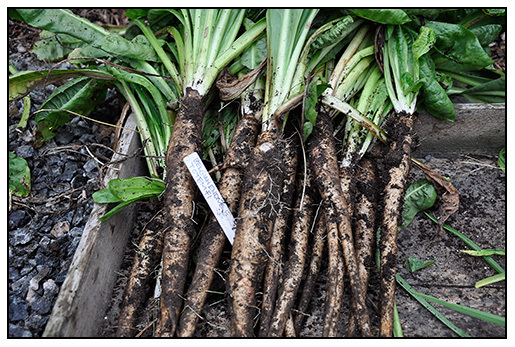 THE MOST UNIFORM ROOTS WILL ALL BE POTTED TOGETHER AFTER THEY ARE AIR-DRYED ON THE POTTING BENCH IN THE GREENHOUSE. SMALLER ROOTS WILL BE POTTED IN A SECOND CONTAINER. The variety I selected to grow is from Johnny's Selected Seeds, TOTEM F1. A very good guide in pdf format is available from Johnny's, you can find it here at the bottom of their page. If you want to try growing Belgian Endive next year in your garden, do download this pdf and then try them. So far, the crop has be much easier than I expected. 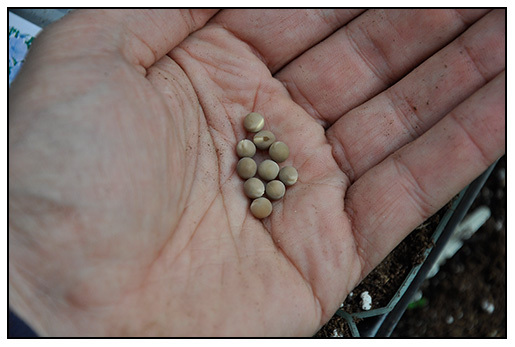 Plant the seed as soon as the soil can be worked, keep them weeded all summer. They prefer draught, and sand soil that is not high is nitrogen. Dig the roots in late October or November before a hard freeze, air dry for a few days in the sun, trim them to remove most of the leaves, leaving an inch or so of stem, and trim the root tips so that they are of uniform length if necessary, and pot tightly, neck-neck in a clean, deep box or pot with potting soil ( ProMix). Keep completely dark and cool until you start forcing in December. Then move the pot to a place where temps are near 70 degrees F, continue to keep the pot wrapped in black plastic or cloth to block out all light. Cut off the tight, light yellow heads when the emerge to a size that you prefer. 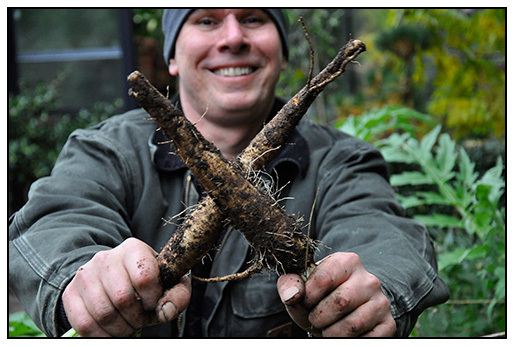 The same process can be used to force Rhubarb ( Dig now and treat the same way, but force in a cold room), and with a difficult to find vegetable called Sea Kale ( Crambe maritima)- Still trying to find seeds for that. I figure that I have better post this now, before we loose electricity here in Worcester ( just west of Boston, on the map above). An unseasonable record-breaking snowstorm is dumping over a foot of heavy, wet snow on us tonight, and it doesn't look good. First, the greenhouse heater won't start ( not that it will do any good once the electricity goes out). At first, I didn't worry, because the soil temperature is still warm ( near 45 deg. F) and the greenhouse is stuffed to the gills with plants that we dragged in today ( ugh, I am so sore) but what I didn't count on was that since the snow is SO heavy and wet, and that the greenhouse is basically hovering around 35 degrees, the snow is not melting, nor sliding off, which it would normally do in the winter. This snow is so heavy, that ever 2 inches on a thin pane of glass will break it. I went to Home Depot to buy a snow rake, but they are sold out. So I am using a squee gee on an extension pole, ever hour, to remove the wet snow. 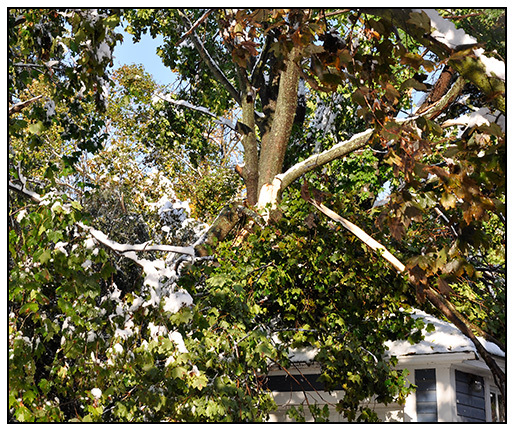 Second - The deciduous trees cannot handle the snow weight. In our yard, as throughout the northeast, tree limbs are coming down left and right, and the storm is just beginning. 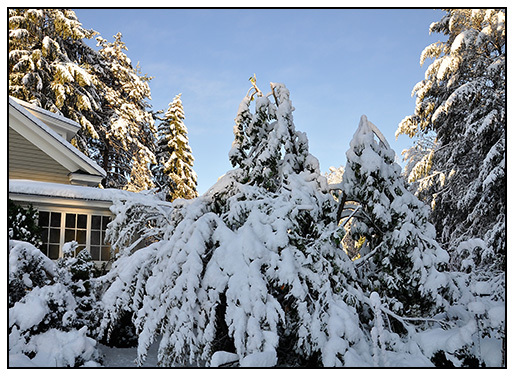 I tried to knock the snow off of the smaller trees, especially the stewartia and the nicer Japanese maples, the rarer ones which are already snapping, and the magnolia's? So long. ( I already lost a mature yellow flowered one). The worst of the storm is not supposed to start until tonight, so the outlook is not good. As anyone who lives in the northeast knows, the summer foliage has not yet left the trees. 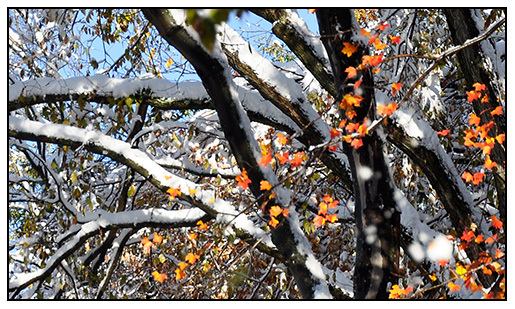 The leaves have not yet dropped off most of the deciduous trees, trees like maple, birch, ash, magnolia and oak, are not designed for holding heavy, wet snow ( which is why such trees loose their leaves in the winter). There will likely be devastating damage to most trees that still have their seasonal foliage. As I type this, I can hear the trees snapping and cracking out in the woods. Not good. 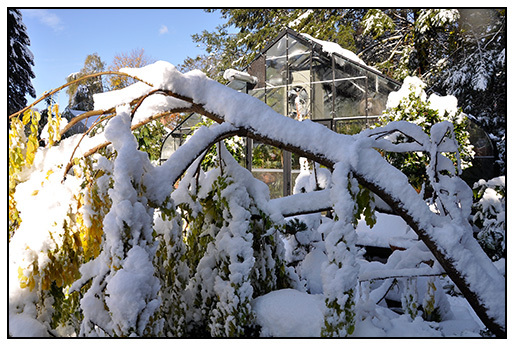 Third- with no electricity, I cannot use the electric heaters in the greenhouse anyway. Fourth, I can't drink, because I need to be sober enough to go out and pull the snow off of the glass. The good things list is shorter. 1. IT will be pretty in the morning. 2. It will be fun to run the snowblower to make paths for the trick-or-treaters. 3. Pumpkins will make great Halloween snowmen heads. NEW WINTER-FLOWERING SWEET PEA VARIETY CALLED 'WINTER SUNSHINE" SPECIALLY BRED FOR LOW-LIGHT CONDITIONS FOUND IN NORTHERN GREENHOUSES. 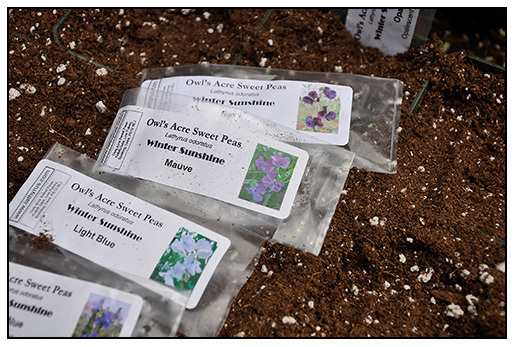 I discovered these terrific, new, winter-flowering sweet pea selections on a commericial exhibition sweet pea grower site from the UK! English exhibition sweet peas could always be grown for winter bloom, but this selection promises to be more floriferous for those of us who dream of picking fragrant sweet peas in the middle of winter. The especially bred for growing under glass in low-light winter conditions, and I just can't wait! They come from OWL'S ACRE SWEET PEAS, a specialist commercial grower of cut flower sweet pea seed located in England, and can be ordered right now for planting outdoors or for under glass. 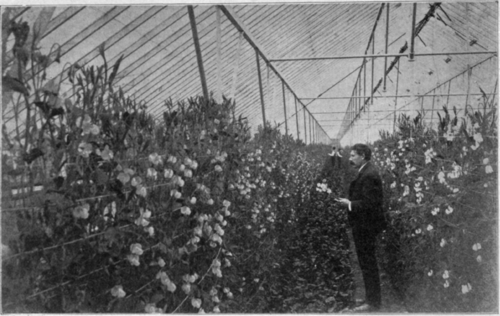 A TURN OF THE CENTURY GREENHOUSE CROP OF WINTER-BLOOMIN SWEET PEAS, AMERICA'S MOST POPULAR CUT FLOWER IN 1900. In California you can grow sweet peas outdoors, but it is safe to say that this selection is worth trying wherever Camellia's survive and bloom outdoors ( zone 9/10 plus?) 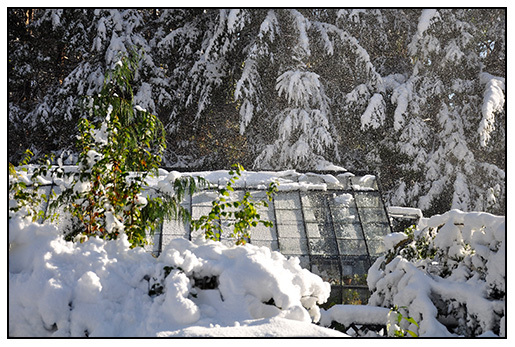 or, for those of us who are northern grower fortunate enough to have a greenhouse or a pit house ( un-heated greenhouse that never freezes). Even if I did not have a greenhouse, I would encourage trying these under lights, or even in a cool, bright bay window or a greenhouse window if you have one. I know plenty of lofts where there are perfectly chilly, drafty cold windows, that are bright, sunny and perfect for sweet peas. Just keep the radiator turned down. 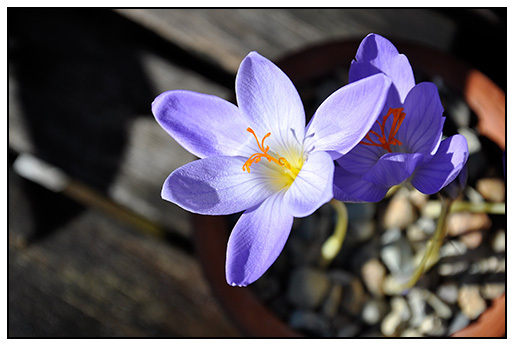 This past Sunday, I planted my seed, all carefully selected to fall in a color range of purple, blue and violets, but today, I fear that mice ate most of the seed ( arrrrrgh!). 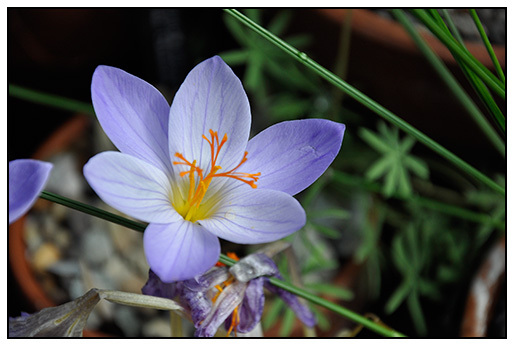 I am holding out that a few seeds made it, since I really don't want to order more. Fingers crossed with visions of cut flower sweet peas next February! 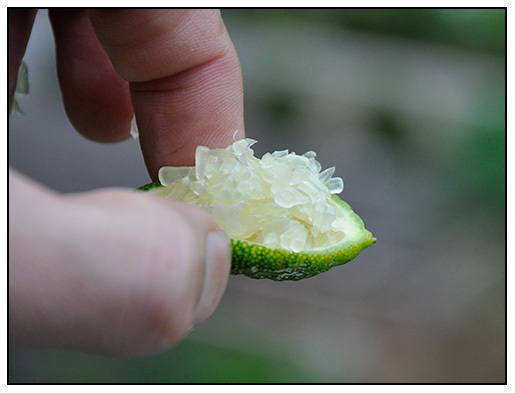 THE RARE AUSTRALIAN FINGER LIME PRODUCES TINY, ELONGATED LIMES WITH CRUNCY SEGMENTS THAT POP IN YOUR MOUTH. These are so cool, that I can hardly control my enthusiasm. They look like little gherkins, but once you cut these limes open, the are pure citrus caviar. 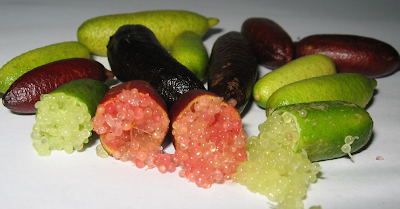 What makes the Australian Finger Lime so delightful is the juicy vesicles that pop in your mouth like caviar ( well, let'e say more like Tobiko). I first saw Australian Finger Limes on an episode of Martha Stewart Living where Byron Martin, owner of our favorite nursery - Logee's in Danielson, CT was showing Martha some of the new citrus varieties that he was offering. He broke one open to show the tiny fruits magic - pearlescent sections of citrusy goodness. They are used in fancy treats, and of course in the coolest cocktails money can buy. Australia Finger Limes are rare, at least in North America, even in California and Florida, they are the rarest and most sought-after citrus since bud wood has only recently been allowed to be imported from Australia, where the lime is one of about a half-dozen Austrolasian limes. According to the Los Angeles Times, some growers are beginning to grow these unique limes, and some are even starting to show up at the Santa Monica farmers market. We rushed out to get some, only to find that they plants were small grafts, so we knew that we had to wait a few years for our shrubs to get large enough to bear fruit. If you are not familiar with this very special lime, the reason that it is so popular is because of the The lime is popular in hip New York City cocktail bars, and with upscale caterers who find the fruits novelty irresistible. But this is a growable plant, especially in the house. Mine suffer a bit if the greenhouse gets too cold in the winter, ( I've killed two until I learned that the younger trees prefer warmer temperatures). My larger shrubs survive just fine with the night-time temperatures that often drop below 40 degrees F. in the winter under glass, but on a cool, sunny windowsill, you could be harvesting Australian Finger Limes in a year or two. The plant grows bushy, more like a shrub than a small tree, and like most citrus, it produces fragrant flowers. Its only drawback would be the thorns, but they are tiny and I feel, add to the charm of the plant. 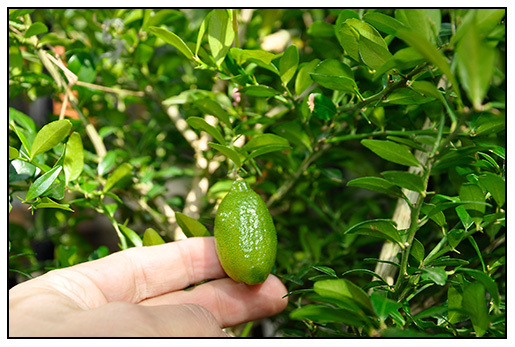 THE AUSTRALIAN NURSERY, DALEY'S OFFERS MULTIPLE COLORS OF FINGER LIMES. They are available from Logees Nursery in the USA or from Daley's Fruit Tree Nursery in Australia ( only for shipments within Australia). The photo below is from Daley's, showing the various varieties and colors available. 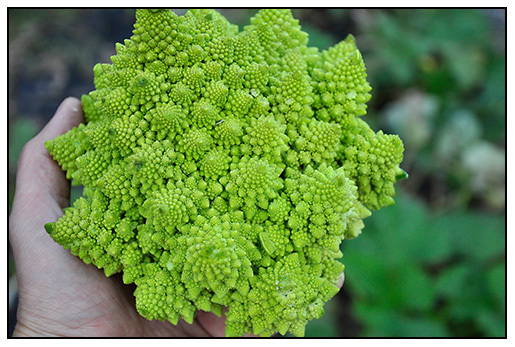 THE HEIRLOOM ITALIAN BROCCOLI, ROMANESCO, HAS A COMPLEX AND BEAUTIFUL FRACTAL PATTERN SEQUENCE THAT DEMONSTRATES A RECURSIVE HELICAL ARRANGEMENT OF CONES, A COMMON MATHEMATICAL SEQUENCE USED IN 3D COMPUTER ANIMATIONS. Mother Nature has an apple too, but hers is not a computer. This split geometry is not rare at all in the plant kingdom, after all the Fibonacci Sequence and the power of five, is a common sight in the autumn - think of the seed head of a sunflower. In this beautiful head of Romanesco Broccoli, nature takes this patterning a step further - into a 3 dimensional realm. Scientists call this design a mathematically correct recursive helical arrangements of cones. So, in a sense, this could Kai's Power Tools Fractal Broccoli. Whatever, it's cool, and delicious, and even though Romanesco Broccoli may have the same Latin name as regular broccoli, it does taste a bit different, much more sweet and nutty. It's real gift however is its crunchiness and tenderness, unparalleled in the great family of crucifers. I nice head like this will crumble and snap into a thousand tiny morsels. For this very reason, fine chefs prefer this version of broccoli for raw, crunchy crudites and dishes. 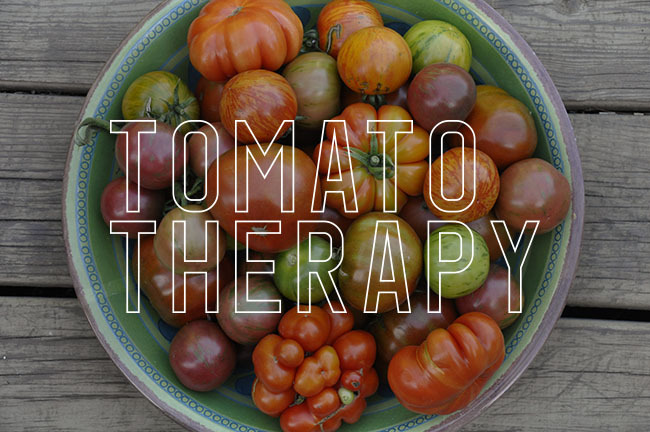 Sadly, this variety is seasonal, so look now for heads at your high-end market this fall. 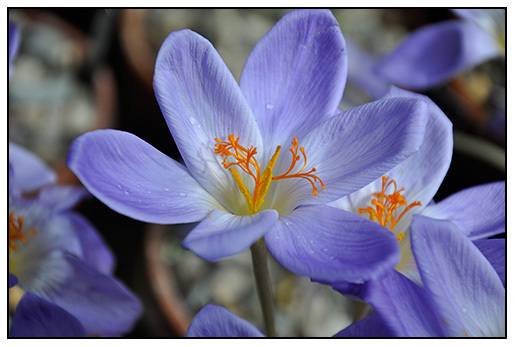 I'm speaking this Saturday at the Berkshire Botanical Garden, leading an class on forcing fall and winter-blooming bulbs, which had be considering what was in-bloom today in the greenhouse at home. Each year is a little different, but there are always repeat performers. 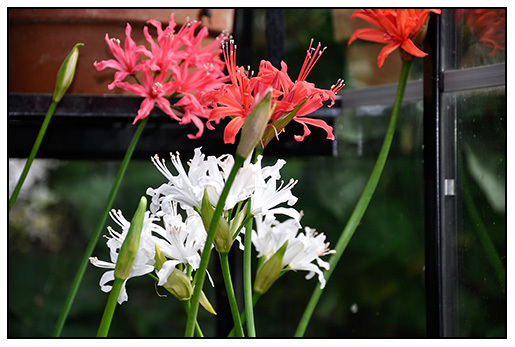 My collection of Nerine sarniensis may look better than any other year, this season, but it won't peak until next week. 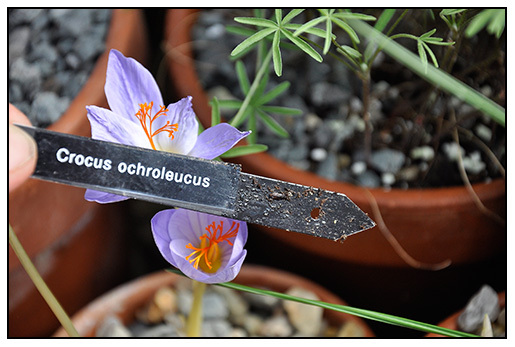 Other bulbs like the Oxalis species from South Africa, and the new autumn-blooming crocus collection are just beginning to bloom. A RARE GREEN DAFFODIL? YOU BET, THIS SPECIES IS A FAVORITE OF MINE, JUST MAGICAL. 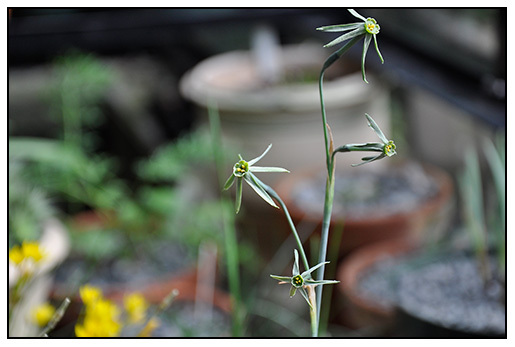 NARCISSUS VIRIDIFLORA IS A GREEN AUTUMN-FLOWERING NARCISSUS WITH A STRONG, UNUSUAL CLOVE-LIKE SCENT. 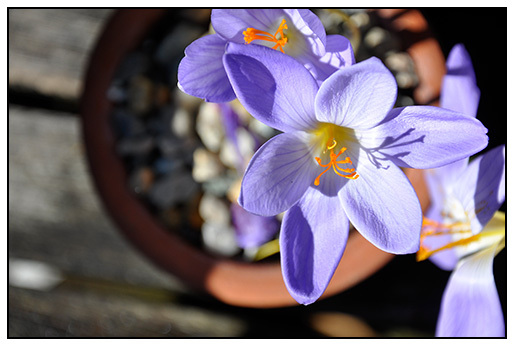 A pot of Narcissus viridiflora is doing very well, since I began with two bulbs five years ago, and I have been able to grow those bulbs into 8 bulbs, and five bulbs are now blooming. Typically, my Narcissus tend to grow weaker each year, but this tender bulb, which cannot freeze, gets s little extra care and fertilizer. I've been trying a new fertilizer and enhancement which I will blog about soon, and maybe that is making a difference with these slow but steady feeders. 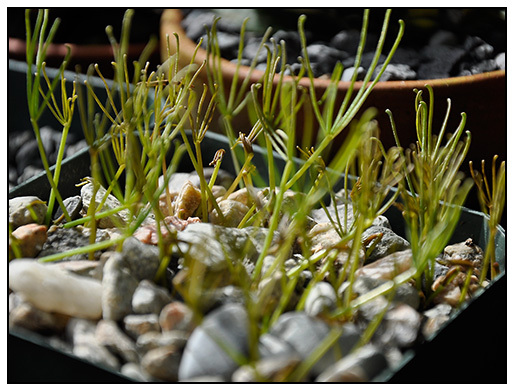 Oxalis species that are bulbous, are highly collectable by plants people with greenhouses, and it seems that every fall I write about them, and include some photos, this year I thought that I might show some of the less interesting ones. 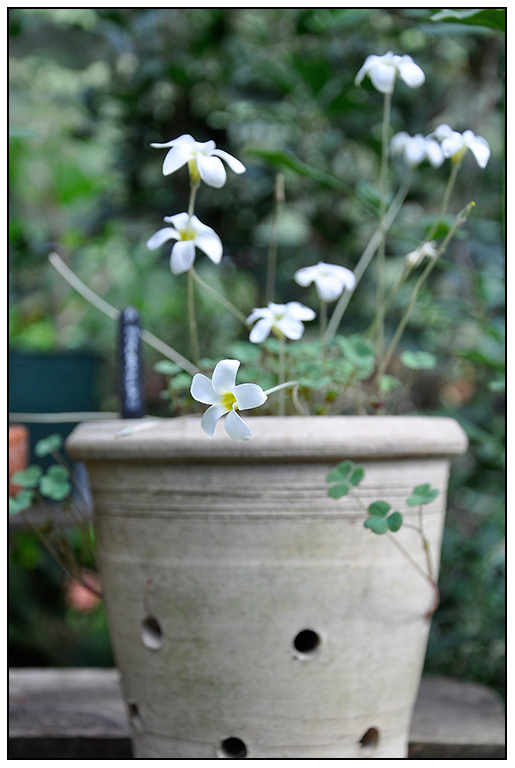 The coconut-scented Oxalis pocockiae truly smells like fresh coconut, and I can smell it before I can see it, as soon as I open the greenhouse door on a sunny day in October. This year I repotted many of the species, and I placed the extras in some plastic pots. 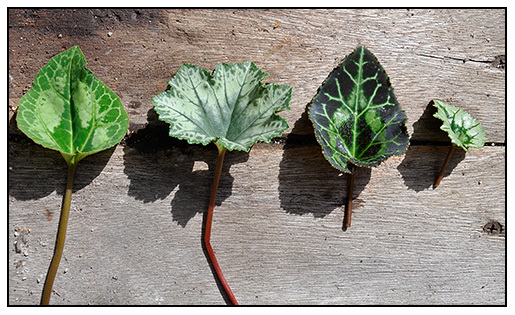 Even in these pots, some of these species look interesting. The foliage of Oxalis polyphylla var. heptaphylla emerges with very thin leaves. A rare bloomer, since this species is notoriously fussu about blooming, and it is most commonly grown for it's foliage which is fuzzy and interesting. I repotted these containers, so maybe being disturbed, helped them decide to bloom. 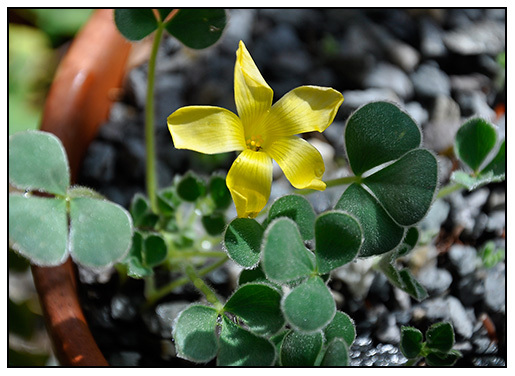 The yellow blossom of Oxalis purpurea 'Ken Aslet' are a nice surprise, since in most years, it never blooms ( 2 blooms in ten years for me). 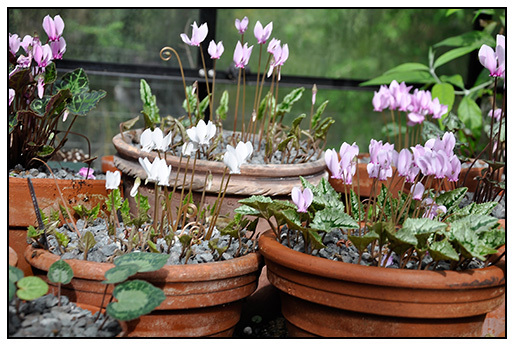 On the two plunge beds where I keep the Cyclamen collection, it is peak season. Nerine sarniensis are starting to open, more on these later. 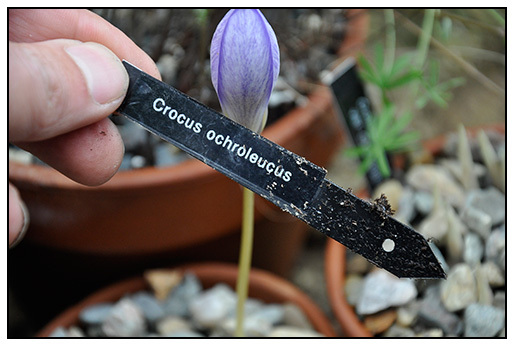 The blue Chilean Crocus, or Tecophilaea cyanocrocus corms are just being potted up. 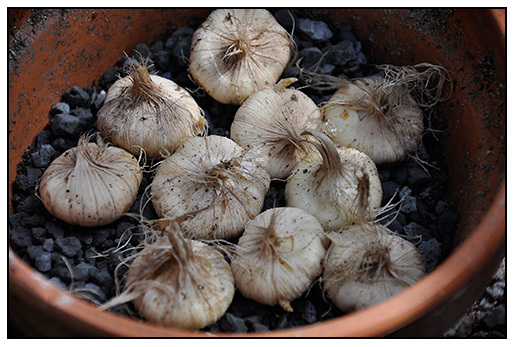 I am planting 25 bulbs this year since I need them for a photo-shoot for a talk I am giving next year. I can't wait to see how they will do, since it is rare to be able to plant so many.